Girls Are Powerful is an organization with a social mission to empower girls to foster strength of character, change the way they view and feel about themselves and embrace their unique individuality. Founded in 2013, Girls Are Powerful was formed as the result of the vision of Shawntan Howell who wanted to encourage girls to embrace and celebrate their Power of being Beautiful, Unique, Smart, Confident and Determined. This desire started after a conversation with her daughter on self-esteem and self-worth. She wanted to start a personal transformation movement that would engage and empower girls to embrace their unique individuality through affirmations, self-reflection, and positive self-talk. Her work teaches girls how to own their power, stand in their power and not give away their power. 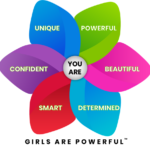 To enhance the self-esteem of all girls by inspiring them to recognize and embrace their natural qualities of being beautiful, unique, smart, confident, determined and powerful. To help support and create a generation of girls and young women, who are confident, maintain positive relationships, make positive decisions and exhibit responsible behaviors by embracing their power. Individuality. Valuing a set of characteristics unique to one’s self, and encouraging all girls to build self-acceptance. Respect. Foster respect of the abilities, qualities, and achievements of all girls and women. Community. Building a safe and inclusive community for girls to exist and thrive, that supports and values each girl and the power they hold. Empowerment. Teaching girls how to identify and cultivate themselves into the influential women they will become. Culturally, the pinwheel symbolizes the constant flow of change in a person’s life. Change is a part of life and each time the pinwheel spins, change occurs around us. This is why the pinwheel was chosen as the Girls Are Powerful logo. For us, it not only symbolizes change, but it also represents inspiration to embrace and own your power! To encounter Shawntan is to encounter a paradigm shift in the way you view yourself, and the way you view the world. A visionary and conscientious thought leader, inspirational speaker, workshop facilitator and mentor, Shawntan Howell is firmly committed to developing others. Her commitment to the development of people is what led to the creation of Girls Are Powerful, a movement complete with engaging workshops, specialized programs and a product line of INSPIRE ME tee-shirts, notebooks and more; all designed to inspire and encourage the next generation of girls and young women to embrace their individuality, hone their POWER and confidently walk in the direction of their dreams and goals. A native of Chicago, IL, Shawntan plowed through obstacles, determined to make more of her life than that her surroundings offered. Pushed by her mother who exposed her to different, enriching life experiences and ensured she was educated outside of her community, Shawntan holds a B.A. in Statistics and Computer Science from the University of Minnesota-Morris and an M.A. in Leadership from Augsburg College. Shawntan has facilitated workshops for several of the Minnesota and Wisconsin River Valley Girl Scout troops, and with a sharp focus on community involvement, has partnered with the Minneapolis-St. Paul Chapter of The Links. Forever advancing the mission, Shawntan has been featured in several local and national platforms including Insight News, Minnesota Got News Wire, the EncourageHer Network and Women Helping Other Women Live, Love & Learn with Michelle Dean. Shawntan currently resides in St. Paul, Minnesota where she continues to uplift and enlighten young girls by creating a shared understanding of how girls and young women should feel and view themselves. Special THANK YOU to those who inspired me to reach for my dream and those who encouraged and pushed me to the next level of this journey. Everyone needs to be inspired at some point in their lives, so thank you for being my inspiration!